"Oh, you’re in trouble now." Kestrel is an athletic young African-American woman. She changes her “Zero K” disguise periodically; the most recent version is a white and blue body stocking with a white utility belt and and goggles. Kestrel is defiant and independent, and can come across as abrasive. She demands respect, and she has little patience with people who fail to give it to her. The mistakes she made when she was younger motivate her to go overboard and prove that she is a good person who can be trusted, but secretly she fears that is not worthy of that trust. She does not make “ice” puns. Guilt: The character is driven by a desire for redemption from sins from their past. Vulnerability: Zero K's powers do not work in extreme cold. Kestrel was a gifted gymnast who was invited to take part in the USA Gymnastics Women's National Team Training Camp. Unfortunately, when she and another girl were trying to break into a snack machine, Kestrel’s heat-absorption powers manifested, injuring the other girl. Kestrel was sent home to New Orleans in disgrace. Back home, she soon fell in with a bad crowd. It was during a robbery that went horribly wrong that Kestrel’s heat-absorption powers manifested again. Kestrel instinctively used her powers against her best friend in order to save a shopkeeper’s life. Kestrel and the rest of her gang fled; Kestrel assumed that she had somehow killed her friend. She swore from that day that she would use her powers responsibly, and make up for the harm she had caused. Zero K is capable of draining the heat from the world around her, at a maximum range of several miles. She can selectively drain the heat from the atmosphere or her opponents, resulting in a variety of cold-based effects: a rain of razor-sharp icicles, an obscuring snowstorm, a wall of ice, and so on. 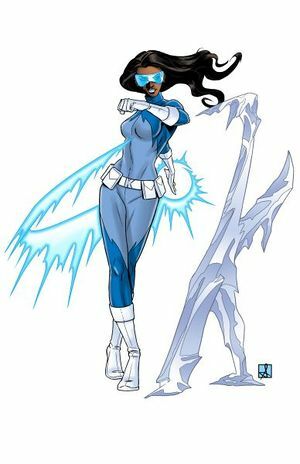 She is virtually immune to any heat-based attacks, but her powers are dependent on there being existing heat for her to absorb: the colder the ambient temperature is (not including effects that she herself creates), the less potent her powers are. This page was last modified on 5 December 2014, at 10:22.